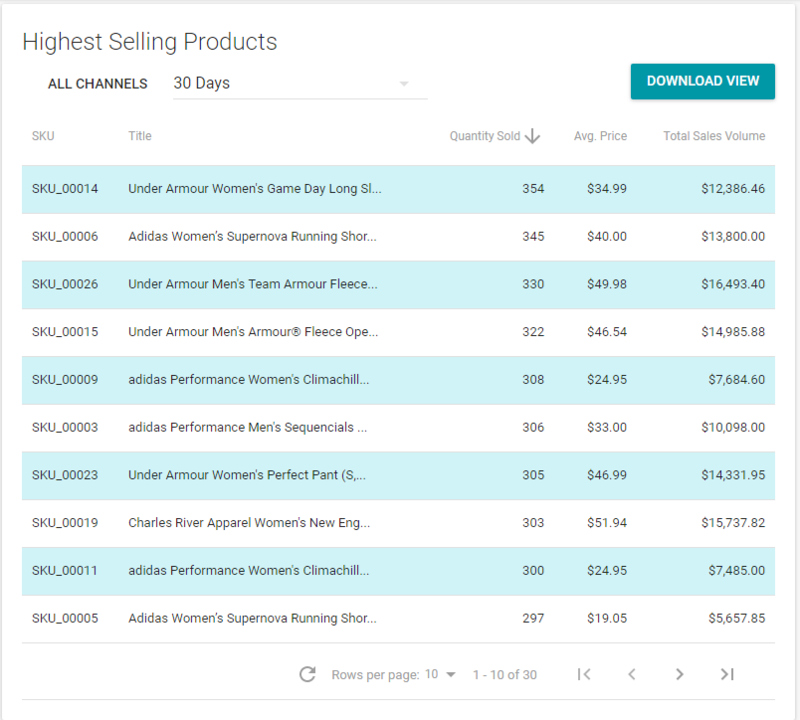 Your Dashboard gives you valuable insight into the health of your catalog and sales. Understanding how to use and read the various tables on your Dashboard is key to having a successful experience with Zentail. This article will detail the various tables and graphs on your Dashboard. Please note, if you are not able to view certain tables on your Dashboard, it is likely you don't have permission to view sales data and need to contact your account Admin. More information is outlined on our Manage User Access article. This metric indicates how many of your orders have some sort of alert that needs to be resolved. This can include an alert that the order could not be routed to a warehouse, or an invalid address associated with the order. More information can be found here: How do I resolve an alert to clear an order from the Needs Attention status? This table provides a quick view of how your sales are trending. It considers sales from every channel where Orders Sync is enabled with Zentail. You can adjust the time period to "Day over Day", "Week over Week", "Month over Month", and "Year over Year". This table displays how many of your products have received an error message from a channel within the past hour. Clicking the 'orange number icon' directly to the right of the CATALOG button directs you to a section on your Catalog that displays all SKUs with a listing error. It is recommended you regularly audit this section to keep the products with listing errors to a minimum. This section gives you an idea of how complete your product data is in Zentail. The Products with Missing Attributes table displays how many of your active SKUs are missing essential attributes. Clicking on the number under each field will direct you to the Missing Attributes filter on your Catalog page. If you do not see these fields on your Dashboard, congratulations! That means all of your active SKUs have that attribute filled in! This table gives you a snapshot of your average order over the last 30 days, as well as the total number of sales made. In the screenshot above, the average order totaled $50.31 in revenue for negative profit (yikes! That's why you don't use a Demo account for your screenshots). Each order included 5.76 items, on average, and the best selling SKU was the Adidas Womens Supernova SKU. This is an interactive graph that allows you to view your sales over a time period for specific channel or channels. We highly recommend playing around with this to see what sort of information you can extract! If you find this tool useful, you should check out the Business Analytics suite! Your Product Listing Errors graph keeps track of how many error messages we're receiving for your catalog. The "View Recent Errors" report brings you to a view dedicated to listing errors. This page can be filtered by channel and type of error, and even downloaded to a .csv. Here's a link to the download screen: Product Listing Errors Report. This chart gives a visual of the proportion of your sales by channel. You can adjust the time period using the drop down to view your sales through a number of preset time periods as well as a custom date range. We hope you like the pie chart, we put a lot of thought into it! View your highest selling products over a given period of time. Like the Sales by Channel graph, the time period is adjustable. You can also download this section to a .csv for further analysis. This graph allows you to view what percentage of your catalog owns the Buy Box on each marketplace. This table provides a snapshot of the value and cost of your inventory within each warehouse.